Leather Resource - What is Leather? Skins and hides are rarely used in their natural state as they are subject to rotting and temperature variations (hard and rigid when the temperature is low, soft and flaccid when it is high). The purpose of tanning is to eliminate these problems using suitable agents of animal, vegetable, mineral or synthetic origin. The epidermis and everything attached to it - hair, fur, follicles, sebaceous and sweat glands, horney, material etc. - is usually eliminated as it is not used except by furriers. The "flesh", which is white connective sub-cutaneous tissue containing fat, is also removed. The dermis is processed to obtain the tanned hide or leather. It consists of bundles of connective fibers, made up of even smaller fibrils which are all interwoven to form a three-dimensional "mesh." It is very dense towards the surface (papillary layer) and less dense in the reticular layer. There is a mass of cemented substances composed of a protein complex (globulin) between the fibers; the fibrils are composed of a protein called collagen which is of fundamental importance in the tanning process. As a matter of curiosity, the total surface area of all the fibrils contained in just one gram of leathers in 50 square meters! 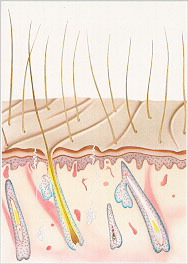 The surface of the fibers collect and circulate the perspiration in the form of vapor and transfer it to the outer surface of the skin. This also occurs even if the skin is partly impermeable to water. Leather, in fact, is a unique material which prevents liquids from passing but not gases or vapors. 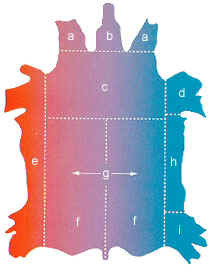 In tanning there is an important distinction between the upper part of the dermis (in contact with the epidermis, which makes up what is called grain leather and is characteristic of each different type of animal) and the part below (reticular layer) which is called the split.